I started working in fashion about a year and a half ago, and I'm not going to lie, joining this world of ever-changing trends and styles was incredibly daunting at first. You can probably only imagine how I felt on my first day walking into the Who What Wear offices, overwhelmed by the effortlessly chic women who work here. But as I settled in, I realized that I didn't need to be intimidated, but rather I could learn a lot from my stylish co-workers. Now I can safely say they've taught me pretty much everything I know. The most important lesson I've learned from the likes of Lauren and Michelle? How to effectively shop on a budget. I've come to believe it's probably the most valuable skill for a girl like me to have. Not to pat myself on the back, but I think I've gotten pretty good at it over time. In fact, I'd go as far as to call myself a professional budget shopper. Kidding, but only kind of. But trust me when I say that I now know the ins and outs of finding affordable pieces and where to look to find budget-friendly shopping success. My favorite retailer for these types of buying sprees is Shopbop. Between the wide selection of covetable styles and the Amazon Prime–eligible free shipping, Shopbop is an underrated source for the best selection of affordable pieces. It's my forever go-to for under-$200 items that keep my wardrobe fresh and interesting, so I've decided to share with you what I'm currently coveting from the retailer. Shop my wish list below. Our editors swear by these jeans. Docs are everywhere this season. A faux-fur jacket you can wear with anything. Try the latest Instagram trend before it gets big. There's a reason these Levi's are best sellers. I'm living in this coat this winter. The perfect tee from a stylist who knows fit like the back of her hand. 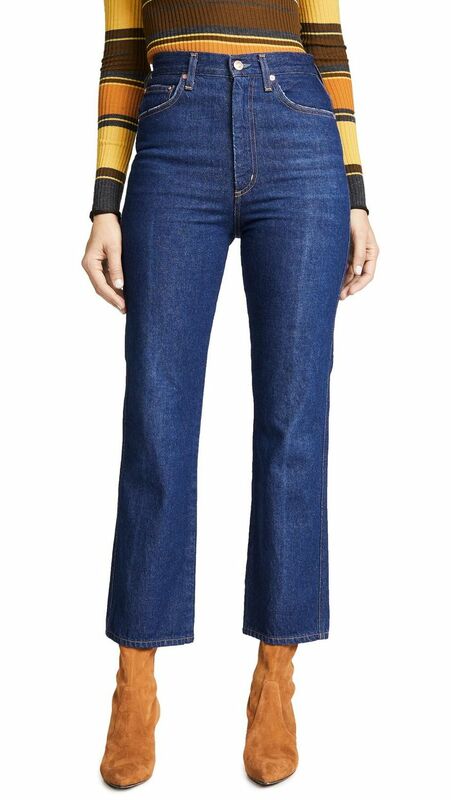 This colored denim is the perfect addition to your winter wardrobe. The rough hem on this skirt gives it a distinct edge. Go ahead, try a Dad fleece. Dreaming of summer with this necklace. You can never have too many little black dresses. If you're going to try one leopard-print piece, make it this one. The 2019 way to wear your cardigan? As a top. Your every day black bootie, found. Hop on the trend if you haven't already. Always a fan of Staud. Mix the pearl and pendant trends with these chic earrings. A modern take on a white blouse. Another way to try the animal-print trend. Faux leather pants are a must-have and this pair is so affordable. These Meghan Markle–approved sneakers are everything. No such thing as too many feathers. A subtle take on the animal print. I'm not sure more versatile shoes exist. Try the matching top for a full look. Get in on the tie-dye trend before your friends do. Up next, the shoes NYC girls won't be wearing this winter.